The Spirit Book Series CD is a comprehensive presentation of Susan's most significant body of work to date. 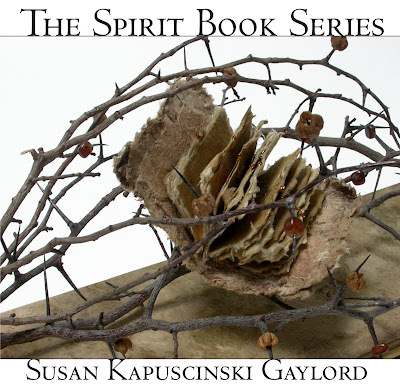 In addition to striking photographs, it offers insight into Susan's seventeen-year journey from her first gathering of twigs and branches to the completion of the Spirit Book collection, her earlier work in calligraphy and the book form, articles on the Spirit Books, Resources, and a Spirit Book Workshop. Designed for easy navigation, the CD offerings may be viewed on a computer screen or projected in a class or lecture setting. You can purchase a copy for $24.95 at susankapuscinskigaylord.com or from John Neal Bookseller.